In a bid to diversify its economy, which remains largely dependent on natural resources (accounting for a third of GDP in 2010) the government of Kazakhstan is aggressively ramping up finance and business support to small businesses. The 2008 Global Financial Crisis had a deep effect on Kazakhstan, with the number of registered companies declining by nine percent in 2009. In response the government introduced a stimulus package, recapitalising banks with 272 billion tenge ($883 million) between December 2007 and December 2009 to ensure the lending was increased to small firms. The Damu Entrepreneurship Development Fund, which oversees the government’s SME financing, co-ordinated the state’s SME stabilisation programme. There has been some success. A 2012 analysis revealed that lending to small businesses began picking up from 2010. In addition banks lowered the average interest rates on loans to SMEs – from 15.7% in 2008 to 12.1% in 2012. Over the same period banks also increased the share of lending to the outlying regions (outside of Almaty and Astana) from 35% to 46% of total credit. The share of loans to the industrial sector almost doubled to 14.3% of credit. As a result of the stabilisation programme, the Damu Fund’s small businesses financing share grew from 10% of total bank loans in 2008 to a peak of 34% in 2009. As of 1 October 2015, the total amount of funds provided to the SMEs had exceeded 1.1 trillion tenge. In addition a programme of conditional placement of funds by partner commercial banks for subsequent lending to microfinance organisations was started in 2009. As of November 2014, there were eight microfinance organisations financed through this programme, with a total of 1.7 billion tenge. The Damu fund also guarantees SMEs loans, allowing entrepreneurs to get up to a 85% guarantee on the loans for up to 180 million tenge. This has helped those firms that lack the necessary collateral to take out a bank loan, to access finance. As of 26 October 2015, 1 390 loan guarantees worth 26 billion tenge had been signed for loans totalling 60 billion tenge. In 2010 to help diversify the economy, the government began a programme (State Program of Forced Industrial-Innovative Development for 2010-2014) to boost investment in priority sectors by subsidising the interest rates on bank loans. The programme formed part of the government Business Road Map 2020 plan which aims to support new businesses, improve the business sector and enhance the country’s entrepreneurial potential. As of 27 October 2015 the programme had supported over 6 400 projects with loans of over 1.2 trillion tenge and total paid subsidies amount to 106 billion tenge. The Damu Fund also provides the non-financial measures such management training in partnership with foreign training centres. Up to 2015 almost 1 600 of people had received training at Nazarbayev University Graduate School of Business. In addition 73 missions involving the qualified foreign specialists (Senior Seniors programme) on introduction of new management techniques, production technology, equipment and training have been run. In addition by October 1, 2015 almost 2 700 business people had received support in meeting potential trade partners. Entrepreneur Service Centers offer consultations on the tools and programs of Damu Fund, and other programs of the State support of the entrepreneurship. To date, over 100 000 borrowing entities have received over 200 000 services. The 100 Concrete Steps programme launched by President Nursultan Nazarbayev in 2015 aims to get the country to become one of the top 30 developed countries by 2050. It includes cutting red tape and making the country more attractive for investment. The promotion of entrepreneurship will also play a key role (including a target for 40% SME contribution to GDP by 2030, and 50% by 2050). Over the recent years the government has made it easier to do business Kazakhstan. It has cut the time it takes to register a business from an average of 26 days and 10 procedures in the 2004 report, to 5 days and four procedures in the 2016 report. It now takes just four days to register property, down from 52 days in 2004, while over the same period the time taken for a medium-sized firm to complete tax has fallen to an average of 188 hours in a year, from 271 hours. However it still takes an average of 1.5 years to settle insolvency and 370 days to enforce contracts, though the latter has fallen from 410 days (last year it introduced simplified procedures to handle small claims, reducing backlog at the main trial court – Doing Business 2016 report). In the 2014/15 year Kazakhstan was among the top 10 countries to have shown the most improvements on the World Bank’s Doing Business indicators, in 2014/15. The economy has been growing at other five percent a year since 2010 (but is set to slow in 2015) and the number of active registered SMEs have increased by 29% between 2007 and 2013 – from 643 000 to 895 000 in 2014. In addition SME’s contribution to total employment has increased from 27.6% to 32% over the same period. However there have been fears in recent years that the economy is overheating on the back of easy credit. Despite a high number of non-performing loans, the rate of consumer lending continues to climb. The fall in commodity prices also is putting strain on future spending plans, with the country losing 40% of its budget revenue, Nazarbayev said in 2015. 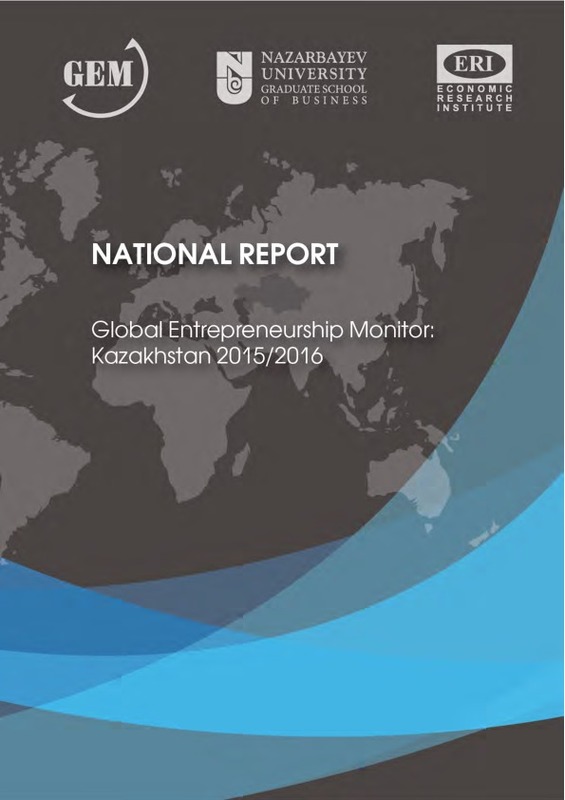 Global Entrepreneurship Monitor: Kazakhstan 2015/2016 report is based on data collected in the Republic of Kazakhstan under the direction of the Graduate School of Business (GSB) of Nazarbayev University in collaboration with the Economic Research Institute (ERI). The goal of this report is to track the state of entrepreneurship in Kazakhstan against the background of relevant comparison groups. The report outlines strengths and weaknesses of entrepreneurship in Kazakhstan, highlights some successes, and indicates which structural conditions play an important role in determining opportunities and threats.